Last week Cipla has moved up over 9%. This move has come after a good 'basing' near its monthly support at 460-470 levels. You may recollect my view through an article on Pharma sector and a short analysis of Cipla in the same article. The anticipated 15% move which I was expecting has come about in most pharma stocks since then. Cipla has also moved by around 12% since then. 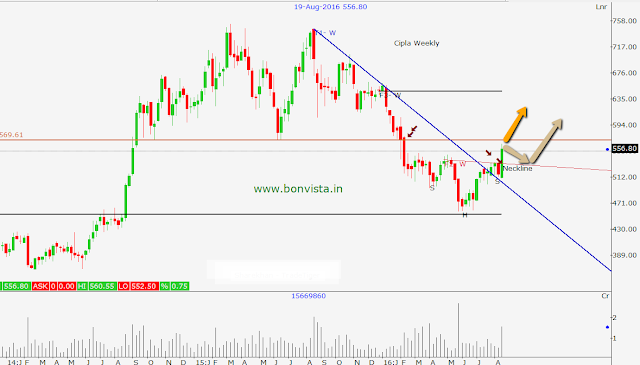 Here is further analysis on Cipla. On weekly chart you can see that stock, after 'basing' near support at 460-470 levels, now crossed the hurdle at 540 last week. The weekly breakout has come with good volumes too. Overall structure has formed an inverted Head & Shoulder pattern on weekly chart. We need to understand here that the inverted H&S is nothing but an indication of cycle change from 'Lower Top Lower Bottom' to 'Higher Top Higher Bottom'. In my course on Technical Analysis for Positional/Swing Traders, this topic is covered in details. Coming back to the chart, you can see that the neckline is broken with a good conviction. This breakout can take stock to further highs. One should also observe that there is an hurdle coming up near 570. However it should not be difficult for bulls to to take that out.